Seriously melt in your mouth. And in this case, served with Apple Pear Butter. Every now and then, I like to do something I call a Food Odyssey. I’ve done a Pie Crust Odyssey previously, where I tried out several different pie crust recipes in order to find the ultimate in flaky, tasty piecrusts, and now, dear readers, I bring you the…DINNER ROLL ODYSSEY! Yes, bread, delicious bread! That gluten-filled, yeasty yumminess that is never quite so good as fresh out of the oven and buttered and happily snacked on. I didn’t grow up with dinner rolls, but I do like them. They’re such a perfect little serving size. And what, you think I serve them with dinner? Ha! Ha ha! Well, I have been known to do so, but really, I use them for snacks, for lunches, and to eat when I’m foraging for food at midnight. Which recipe to start the odyssey with? Well, in the U.S. (and yes, I’m Canadian) apparently the restaurant chain called something like ‘Texas Roadhouse Grill’ or so, has mouth-watering dinner rolls. So, hey, why not start there? I used this recipe from www.foodfanatic.com, but me being me (*cough*Queen of Substitutions*cough*) I used 1/2 c. of milk powder instead of honey. Why? I still have milk powder leftover from the Venezuelan milk candy that my mother-in-law made for my wedding. Which was a few years ago now. Waste not, want not, and all that jazz! I figure the milk powder will add extra nutrition, and it’s sweet, so that can replace the honey. 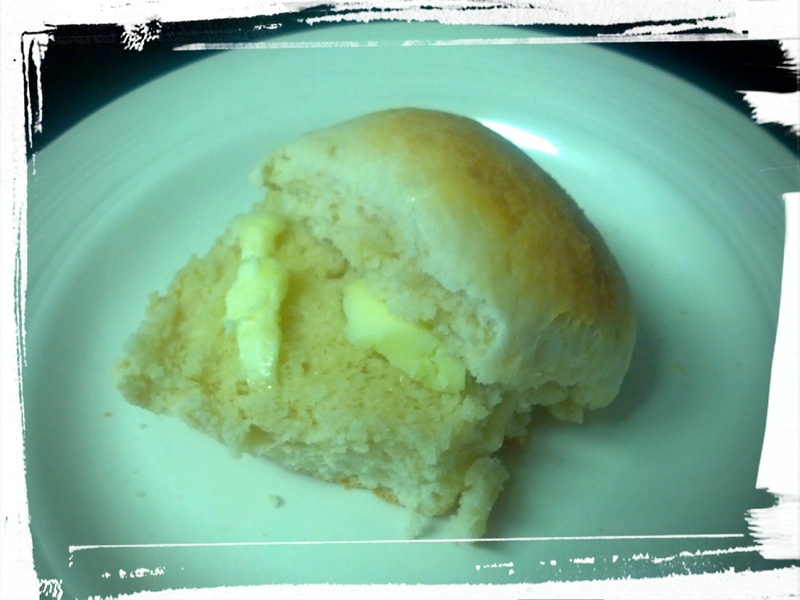 Plus, as I learned when I made Schoolhouse Rolls, milk powder adds a special, indefinable taste to buns. It just makes buns taste better in my opinion. The result? Yummeh! 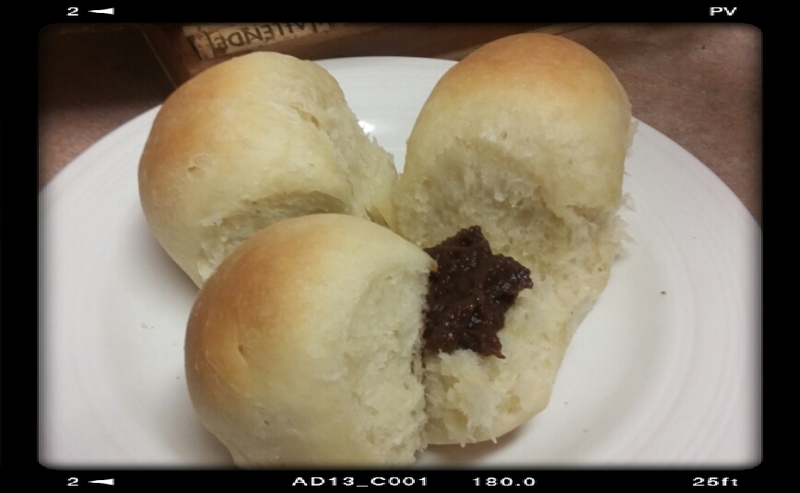 They tasted a bit like my Schoolhouse Rolls, I thought. Which makes sense given that I did used milk powder. I wonder how they would taste if I actually used the honey the recipe called for. Should I make the recipe again, and follow it to the letter? Meh, boooorrrrring. I want to move on to the next recipe already! Ooh, a whole tray of buns! I wonder how long this will last me…. I would recommend mixing the yeast with the warm milk and letting that proof for a bit, i.e. let it sit until foamy, maybe 20 minutes or so, before adding in the flour. The original recipe says to mix the flour and yeast together, but I’ve never heard of a bread recipe that didn’t proof the yeast and I think it makes the bread fluffier if one does so. So I’d recommend it! It will turn out ok without the proofing, but…I think proofing it makes it better! So this recipe was ok. 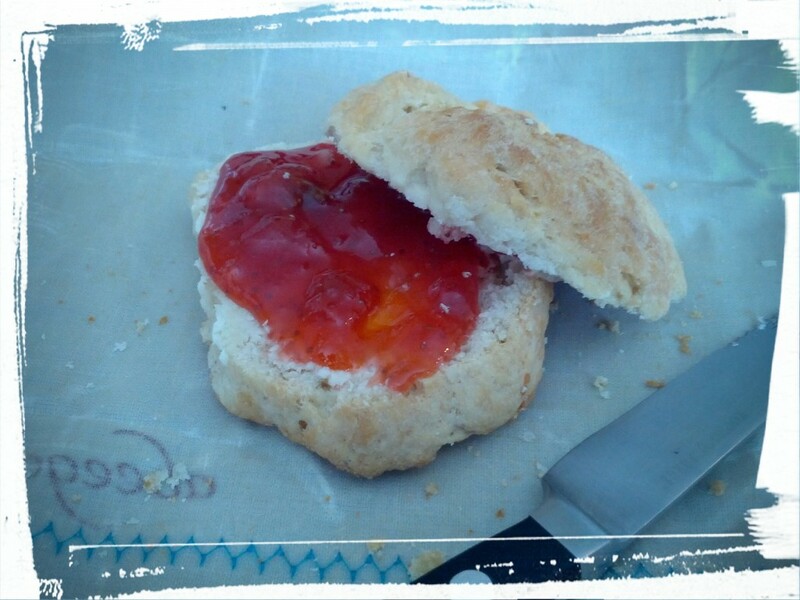 I mean, I enjoyed the freshly made, warm, buttery bread (oh dear, now I want to eat another one! ), but I think it could be better. 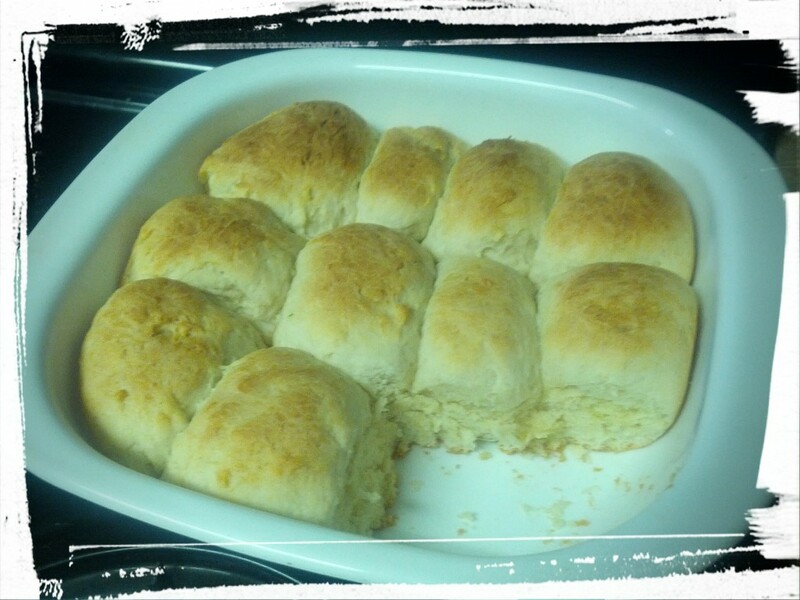 So…on to the next dinner roll recipe! And the odyssey has begun. Stay tuned! Next Post: A Memories of Meals Past Post! And then back to bread, delicious bread! This entry was posted in Food Odyssey, Quick Breads on March 16, 2016 by Margaret. Still life in loaf. Note the still melty chocolate chips! I’ve been planning to make a post about pumpkin pie, as a way to use up the canned pumpkin that I previously posted about, but I couldn’t resist the call of the frozen zucchini in my freezer. 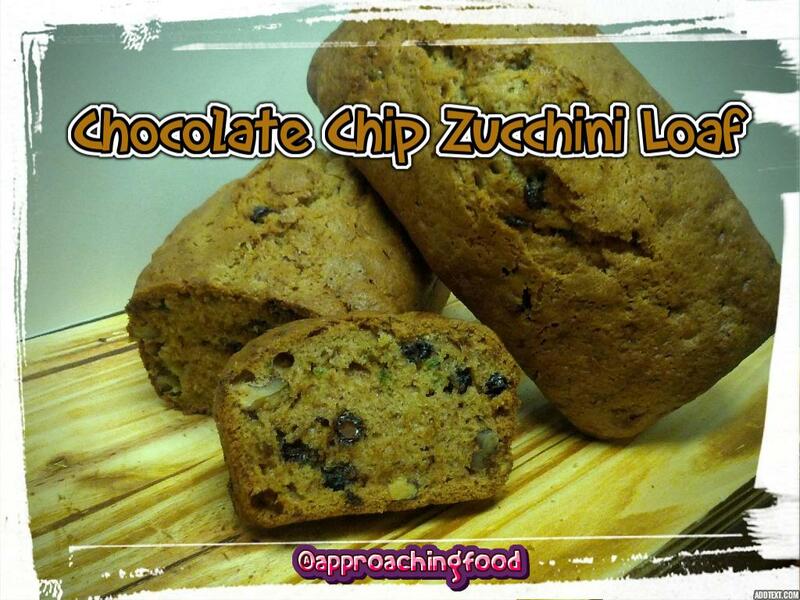 So naturally I had to make a chocolate chip zucchini loaf! Why do I have frozen zucchini in my freezer? Well, the DH bought some a few weeks ago and I hadn’t had a chance to cook it before it was losing optimal freshness. And since we all know that I hate wasting food, obviously I had to do something with it. 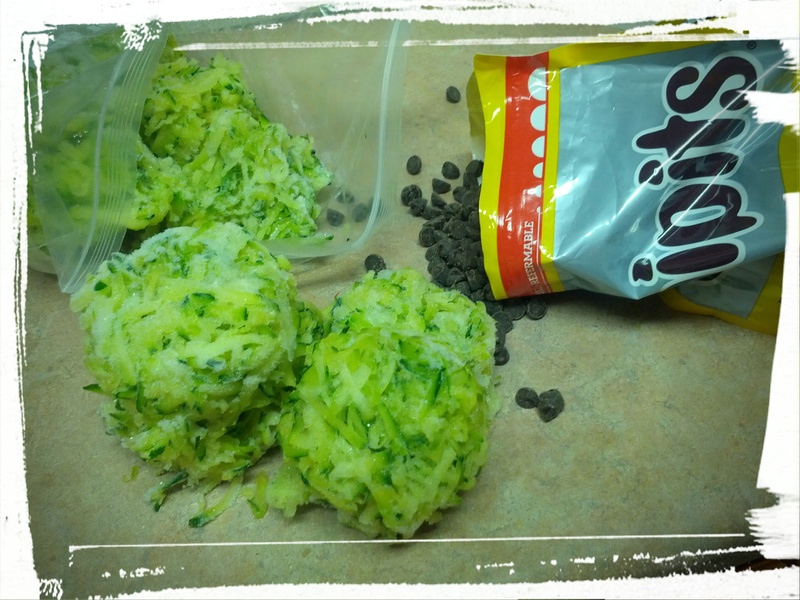 So I grated it, placed 1/2 c. mounds of the grated zucchini on a cookie tray, stuck it in the freezer until semi-solid, and popped the resultant 1/2 c. servings of zucchini into a freezer bag. Bam! Pre-grated, pre-portioned servings of vegetables for whenever I need them! Of course, now I need to actually see how the frozen veggies hold up in the baking. The Chocolate Chip Zucchini Loaves (two) are currently in the oven, and I’m resisting the temptation to peep and see how they’re doing. Watched loaves never bake, amirite? I added a half cup of water, because while the recipe said that the dough would be thick, it didn’t say that it would be the consistency of thick cookie dough and unable to be stirred. I cut out 1/2 c. of the chocolate chips, because the recipe calls for 1 1/2 c. chocolate chips. Cutting out the half cup is my attempt to make it healthier. Ish. I also added in a half cup of chopped walnuts because I have a container of walnuts in my baking supplies cupboard that I want to use up. The DH went shopping at Bulk Barn a while ago, and came home with so. many. nuts. He was so enthusiastic over his purchases; it was so cute! Of course, we have now have large containers of walnuts, cashews, and I believe almonds too. So I’ve been looking for ways to use them up.) And healthy fats are always good. I would totally freeze other grated veggies like I did with this zucchini. The loaf turned out great! I’d likely decrease the cinnamon a bit next time, and perhaps reduce the water to a 1/4 c., as the loaf took about 1.5 times as long to bake as the recipe said. But regardless, it’s yummy! Time for a midnight snack, I think! Next Post: Likely the pumpkin pie I was talking about. Or the homemade peanut butter cups I was talking about. Or the genuine Indian spice I was talking about. Or reviewing a book that the sister of a friend of mine wrote. So much food — so little time to post! 🙂 Any preferences? 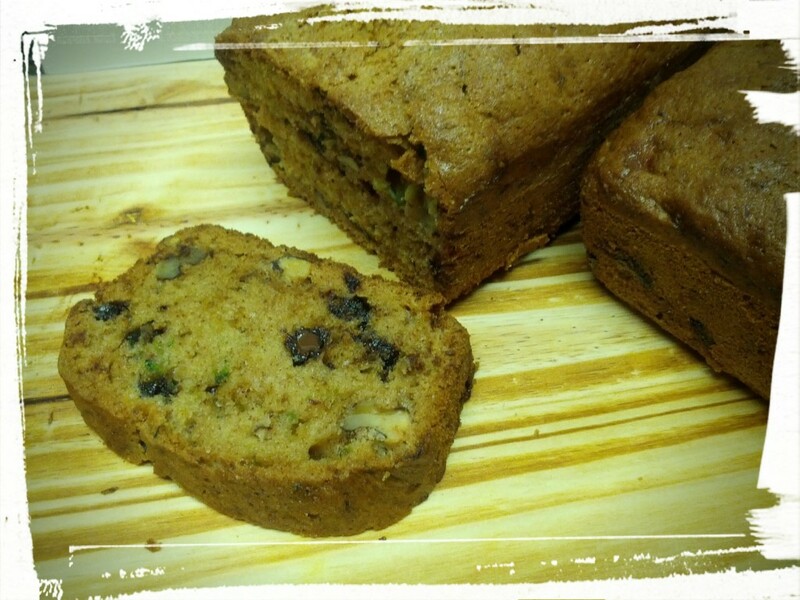 This entry was posted in Desserts Not Otherwise Categorized, Quick Breads, Waste Not Want Not on October 24, 2015 by Margaret. 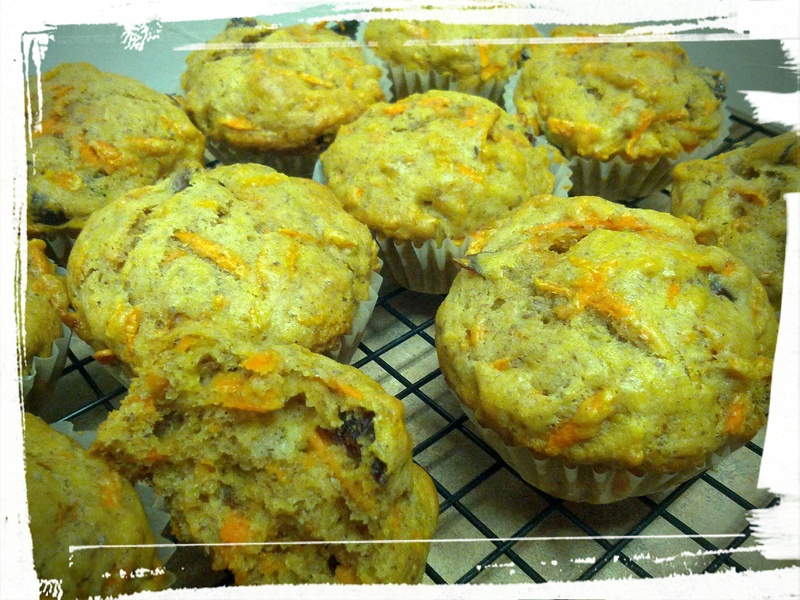 I had some carrots in the fridge that I wanted to use up, and I was craving something sweet but healthy, so last night I made carrot muffins using this recipe. I meant to post it last night but after baking until the wee hours of the morning, I thought I should actually get some sleep, so while it’s not a tbt feature, it is technically a memory of meals past. Good enough, I say! In terms of the recipe, I swapped the raisins for dried cranberries, since I don’t keep raisins in the house (not a big raisin fan) but I always I have dried cranberries for baking. I also stirred in about 1/3 c. ground flax seeds, because I had them in the fridge and why not add some omega-fatty-acids? Good for the brain and all that! And then I added a pinch of ground cloves. If I made it again, I would add some additional spices, and definitely some nuts. I had this warm out of the oven with some chilled homemade apple-pear butter (I used this recipe but subbed in some pears for some apples because why not), and OMG, my mouth was in Autumnal heaven! The flavours of fall all melded together and became so drool-worthy that my mouth is watering again as I type this, no joke. I didn’t read the comments on the recipe beforehand, and if I had, I probably would have reduced the amount of oil in the recipe, just to up the healthiness quotient, but they turned out fantastic, so maybe I wouldn’t have after all. I packed a muffin and some apple-pear butter for lunch today, and then ate them while sitting with a couple of cool cats. I offer pictorial proof. Cat was curious but not impressed. But if you make these, your mouth will be! Just be sure to add in those additional spices. And if you do, let me know what combo of spice you favour for flavour! Next Post: Peanut butter cups! Really! And wine jelly bonbons. This entry was posted in Breakfast Foods, Memories of Meals Past, Quick Breads on October 3, 2015 by Margaret. Yummy in my tummy! Easy-peasy dinner rolls. I’m currently in the middle of making a three-layer brownie and ice cream dessert (post to come!) but had to take some time out to talk about my new favourite dinner roll recipe. Have you heard of Schoolhouse Rolls? Or Schoolroom Buns? Until recently, I hadn’t. But I was googling ways to use up milk powder, and came across very similar recipes for said rolls/buns. Apparently in the U.S. a few decades ago (readers of a certain age will remember, I’m sure), school cafeterias used to make fresh rolls for the school lunches. There are many recipes out there claiming to be the one definitive schoolhouse roll recipe, but what they have in common is the use of milk powder as an ingredient. Roll ’em up and set ’em to rise! And milk powder is something I have lots of! My mother-in-law made some delicious hand-made milk candies for our wedding a year and a half ago (Time! It doth fly! ), and we still have TONS of milk powder leftover. I never use milk powder, but I hate wasting food, so I had to find a way to use it all up. And this recipe is the best way ever! I started out with some of the recipes found online but modified them to what I had in the house. I ran out of white sugar and shortening, so I subbed in icing sugar and butter. 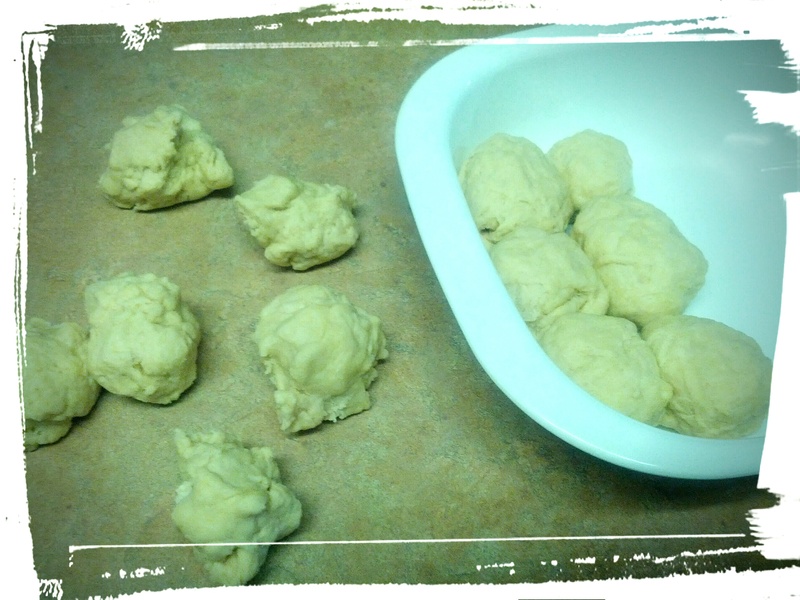 And while the buns were great, it made for a verrrry light and squooshy dough, so I added in an additional cup of flour. I made them and told the DH that I had made some changes. His reaction, verbatim: “I don’t know what you did, but they are SOOOOO good!” Further evidence of deliciousness. I had made a pan of these and left them out one evening to cool. The next morning I got up and half the pan had disappeared. 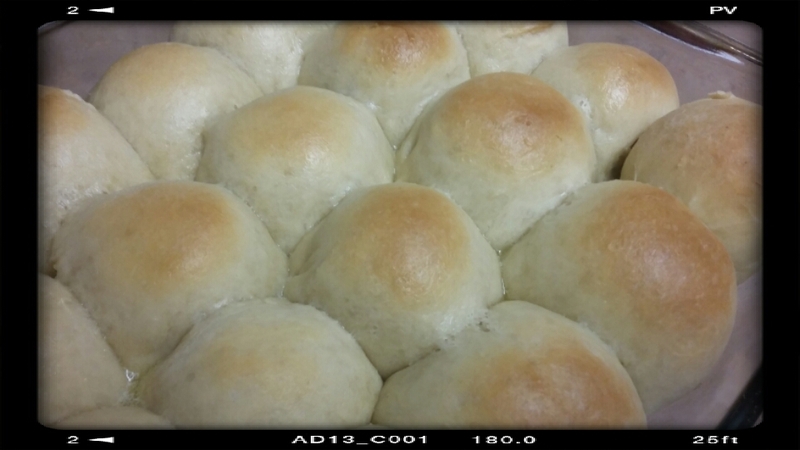 Pan o’ freshly baked buns! Want to make some easy rolls yourself? Let’s! Butter pan. Mix yeast with warm water and wait 10 minutes until foamy. Mix in rest of ingredients with a dough hook (because it’s easier than by hand). Form into 12 equal rounds. Place in buttered pan and let rise in warm place until double in size. Bake in a 425 degree oven until tops are golden and crusty (about 20 min, give or take). Enjoy! Served for lunch with homemade strawberry rhubarb jam! The buns freeze and defrost well, and have a lovely light crumb despite being nice and dense. You can do an egg wash on top, although usually I don’t bother. If you modify the recipe, let me know what you come up with! Next Post: More French Foodie Fun with Fruits! 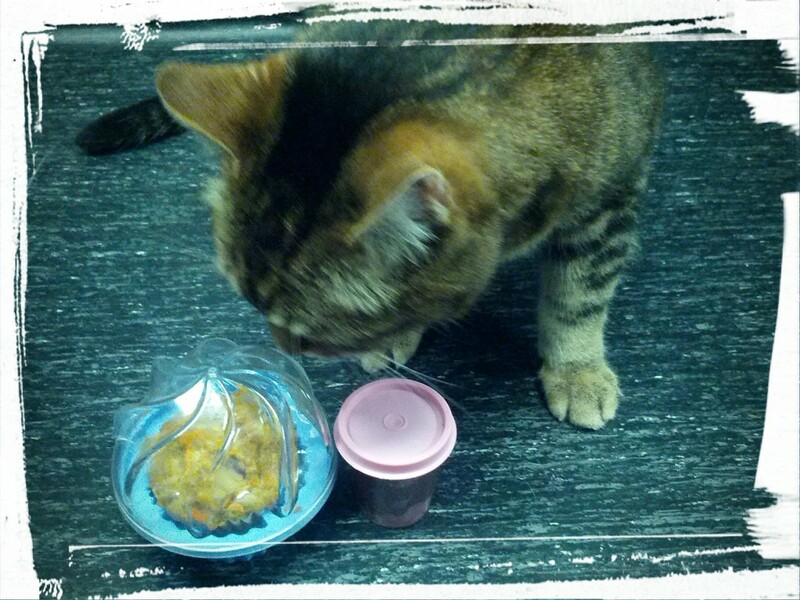 This entry was posted in Quick Breads, Waste Not Want Not on July 13, 2015 by Margaret. Plated and ready for the eating! I love focaccia, but I’m a fan of quick meals and therefore quick breads. And the whole letting the dough rise, and then punching down, and then rising again, etc., etc., is just more trouble than I’d like to do on a regular basis. So I developed (look at me using food blogger lingo!) a recipe that uses my Easiest Pizza Dough in the History of Ever as a base. And wham-o! 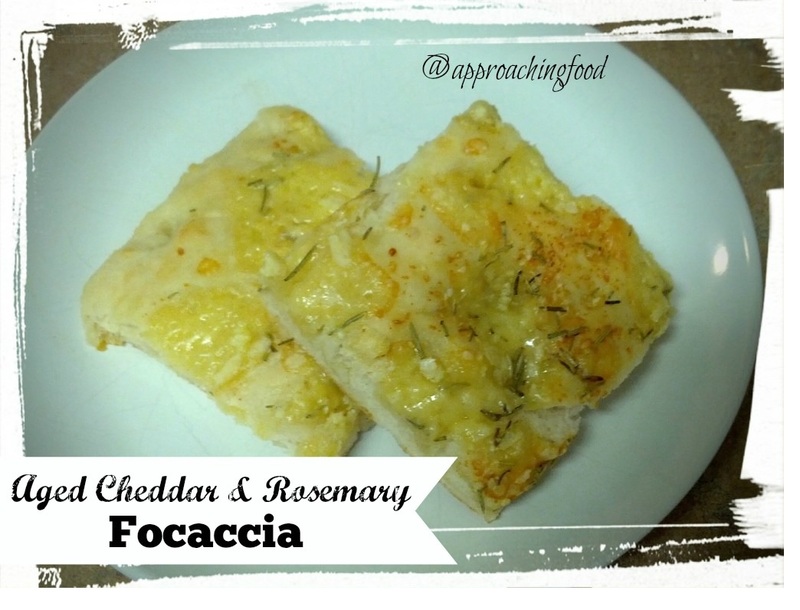 Easy peasy Cheddar and Rosemary Focaccia! But enough with the blatherings, and on with the baking! Make the pizza dough and spread/roll it out to the rough rectangle shape on an oiled cookie sheet. Spread a little olive oil over the top. Set it aside in a warm place for half an hour. 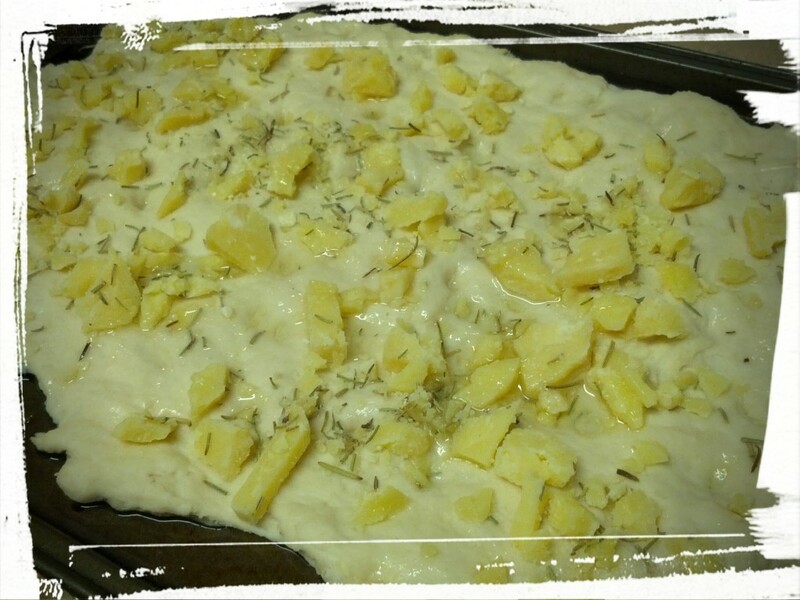 If you like your focaccia really fluffy, leave it in a warm place for an hour. In the meantime, crumble the cheddar cheese, do the dishes, check your email, whatever floats your boat. Once the dough has risen as much as you like, poke little dimples into it in a random pattern with your finger, using little stabbing motions. This makes the traditional dimpled top. Sprinkle the cheddar cheese over the top, followed by the dried Rosemary and sea salt. If you want, you can also sprinkle a little olive oil, but not too much. Bake in a 425 degree oven until the cheese is melted and the dough is golden. Slice with a pizza cutter, and enjoy! 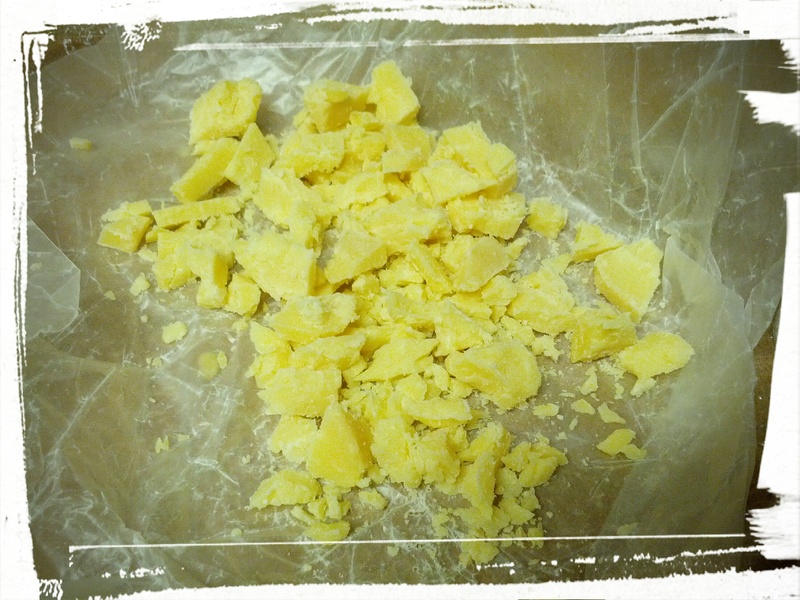 The cheese is more chunked than crumbled. I recommend crumbled. I know I said in the beginning of this post that I don’t like waiting for dough to rise, and then I say to let the dough rise for half an hour to an hour, but there’s a reason for that! You don’t have to let the dough rise. If you don’t, you’ll end up with a crisper, denser, flatbread; and if you do let it rise, you’ll have the more traditional, fluffy focaccia. It’s up to you what you prefer! And of course, you can switch up the toppings! Maybe some thinly sliced tomatoes and black olives? Mmm…want! Next Post: Rhubarb squares, Nutella Rice Krispie squares, or Baked Brie with Chutney — all three are good, so I can’t decide which to post first! I’m leaning towards the baked brie with chutney, though. It’s covered in pie crust. And I do love my pie! Linking Up at Meal Plan Monday! This entry was posted in Quick Breads on May 19, 2015 by Margaret.